It’s best to head into the wilderness already prepared, because once you turn off I-5 (or if you’re heading in from Arcata, once you leave town) you really don’t have many options to purchase or rent camping and boating gear. Check out Redding for last-minute camping equipment, rain ponchos, and headlamps. 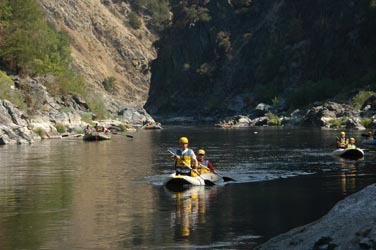 The Klamath River Resort Inn offers kayak rentals and shuttles for self-guided 1-day trips on the Klamath River. (530) 493-2735. Sports LTD is probably your best bet for outdoor equipment near Redding. They don’t have any whitewater-specific gear, but they have a wide range of options for water shoes and camping gear. Located at 950 Hilltop Drive in Redding. (530) 221-7333. The 5th Season in Mt. Shasta has a wide array of outdoor brands and often has good deals at the end of the season. They specialize in climbing and skiing gear, but you can often find things that will be useful on the river as well.